Ebates is an easy way to get some money back when you shop online. 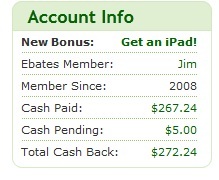 I've been using them since 2008 and so far I've made $272.24 from them. Now, $272.24 over 4 years is not a ton of money. But its simple and easy to earn so as far as bang for the buck, its a pretty good deal. For me most of the money I've made from rebates has been via online travel reservations. When I book a hotel or flight I go through Ebates and typically earn 3-4% or so cash back. So if I spend $300 on a hotel room I can stand to get ~$9 cash back.